Bangkok (Thailand) – December 6, 2018 (travelindex.com) – A landmark project to improve the ratio of both domestic and foreign visitors between main cities vs secondary cities. The Royal Thai Government has approved a series of tax deduction measures to promote seminars, leisure travel and MICE events in 55 second-tier tourist provinces nationwide all through 2018. The measures will support the Tourism Authority of Thailand (TAT)’s latest “Go Local” campaign, a landmark project to promote the kingdom’s emerging generation of secondary destinations, better balance the distribution of tourist arrivals between urban and rural areas, even out the seasonality factor between the months of travel, and encourage more travel during weekdays to reduce pressure on the weekends. TAT will partner with several corporations and organisations in both the public and private sectors to implement and promote the project all through the year. The target is to improve the ratio of both domestic and foreign visitors between main cities vs secondary cities from 64:36 to 60:40. The project will target 10 million tourists to travel to secondary cities and communities, generating an estimated 10 billion Baht in tourism revenue in 2018. The tax deductions will be applicable for domestic travel to the following provinces: Nakhon Si Thammarat, Udon Thani, Chiang Rai, Lop Buri, Phitsanulok, Suphan Buri, Ubon Ratchathani, Nakhon Nayok, Nong Khai, Sa Kaeo, Loei, Tak, Trat, Phetchabun, Chanthaburi, Mukdahan, Nakhon Sawan, Ratchaburi, Samut Songkhram, Buri Ram, Chaiyaphum, Phatthalung, Trang, Si Sa Ket, Prachin Buri, Satun, Chumphon, Sukhothai, Surin, Sakon Nakhon, Lamphun, Nakhon Phanom, Uttaradit, Ranong, Lampang, Roi Et, Mae Hong Son, Phichit, Phrae, Chai Nat, Nan, Ang Thong, Maha Sarakham, Kamphaeng Phet, Uthai Thani, Narathiwat, Yala, Phayao, Bueng Kan, Kalasin, Yasothon, Sing Buri, Nong Bua Lam Phu, Amnat Charoen, and Pattani. A TAT Plus online card will be launched specifically for use in local communities and secondary cities in partnership with F&B outlets, souvenir shops, shopping at Pracharath Sookjai shop, petrol stations, car rental companies, etc. Cardholders will get special discounts and mileage accrual for redemption with various domestic airlines. Encourage companies listed on the Stock Exchange of Thailand (SET) to hold their MICE events; such as, conferences and seminars as well as corporate social responsibility (CSR) activities in local communities and secondary cities in the 55 provinces, especially during weekdays. Partners include the Thailand Convention and Exhibition Bureau (TCEB), the Local Administration Department and various Chambers of Commerce. A corporate tax exemption on income equal to 100% of expenses will be offered for seminars and accommodation rooms, transport and other expenses incurred for conducting staff training seminars in the 55 provinces. This is equal to a 200% corporate tax deduction for such staff training seminar costs. Cooperate with domestic tour operators and travel agents to offer incentives; such as, discounted meals when buying local tour packages covering secondary destinations. 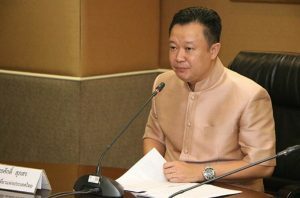 An exemption from personal income tax for the amount paid out to tour operators, hotel operators or homestay operators for domestic tours to the 55 provinces, but not in excess of 15,000 Baht in total. Promote consumption of local food and purchase of local raw materials in cooperation with the Thai Restaurants Association, celebrity chefs, credit card companies, local banks and provincial authorities. Attract food lovers by organising “Eat Local Week” activities under the aegis of different TAT domestic offices all over the country. Offer opportunities to earn points and get privileges; such as, dining at Michelin star restaurants. Partner with the theme and recreational parks, museums and local provincial administrations to organise local community events based on their unique culture and identity. Specific activities will be organised to promote travel to different secondary cities every week, accompanied by rewards schemes for purchase of local arts and craft items and advertising support to promote the events. Organise “mobile clinics” to upgrade the quality of human resources at the community level, enhance their knowledge base to boost their competitive advantage and open up opportunities of the Digital Age. Support speakers, academics, artists and celebrities who can create and design locally-oriented products and services and help local communities access funding support. Strengthen local communities through more integrated public-private sector cooperation, reinforce the supply chain and help improve the quality of products. Develop “Creative Tourism” to enhance the brand image and appeal of tourist attractions, and support new start-up entrepreneurs to promote secondary destinations. A “Go Local” Directory will be launched to provide specific information on dining, travelling and accommodation for getting tax deductions.